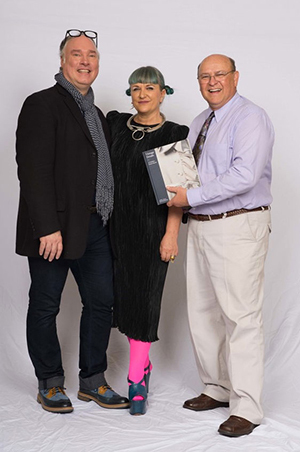 Jeffrey Mayer, left, Basia Szkutnicka and Stephen Sartori. Twenty garments from the College of Visual and Performing Arts’ (VPA) Sue Ann Genet Costume Collection are on exhibit in the Sue and Leon Genet Gallery on the first floor of the Nancy Cantor Warehouse, 350 W. Fayette St., Syracuse. The fashions featured in “Vintage Details: Selections from the Sue Ann Genet Costume Collection” date between 1915-1995 and are among the more than 150 garments featured in the newly released book “Vintage Details: A Fashion Sourcebook” (Laurence King, 2016) by Jeffrey Mayer, associate professor of fashion design in VPA’s School of Design, and London-based Basia Szkutnicka, with photos by Syracuse University photographer Stephen Sartori. While the book offers a stunning collection of more than 600 beautifully photographed details from previously unseen 20th-century vintage clothing, the exhibition expands beyond the selected garments’ stylistic attributes to also discuss the designers and wearers of the outfits. On view through Friday, Sept. 30, the “Vintage Details” exhibition is free and open to the public. Gallery hours are Monday-Friday, 10 a.m.-5 p.m. “Vintage Details: A Fashion Sourcebook” is available in the Syracuse University Bookstore and online. For more information about the exhibition or the book, contact Mayer at jcmayer@syr.edu.